There are, in Lipa, just two tricycles that can take in my whole 5’ 9 ½” inch frame and not make me feel like a sardine stuffed inside a tiny round tin can. The third one, I suppose, is yet to be built. This supposition, I hasten to add, is based on the assumption that there is a tricycle manufacturer somewhere who has realized that there are Filipinos taller than 5’ 4”. Otherwise, if I even contemplate getting into one with another person, I have to simply resign myself to contorting my whole being just to be able get in; being forcibly stooped for the duration of the short journey; and having my hip bone scrape against that of my companion. It’s safe enough to be in on a seldom-used country road; or perhaps within the confines of a housing subdivision. 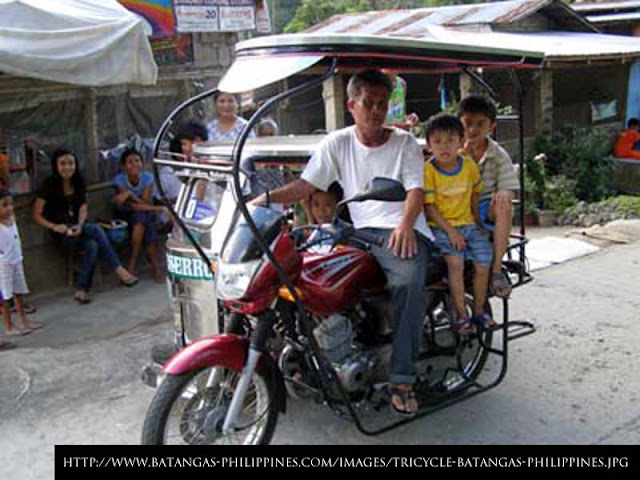 One fears for one’s life, however, when a tricycle ventures into a highway. That tricycle lane along the Ayala diversion road, that was a brilliant idea! I mean, get into a tricycle and then ask the driver to take a spin along any highway. You will quickly come to the conclusion that it is not fun being inside one when an 18-wheeler attempts to overtake. You can always ask, what’s a tricycle doing on a highway to begin with! But hey, this is the Philippines... Who knows why we do the goddamned things we do...??? There are those who do not think too fondly of tricycles: there are way too many of them; they slow down vehicular traffic; they are accidents waiting to happen. These are the common complaints one hears about this form of transport. Yet, the truth remains; it is a law of Economics that there will be no supply unless there is demand. And these tricycles, they maybe just simply embody people’s general aversion to walking... But hey, I understand perfectly... We are in the tropics and the climate contributes to the need to be languid! But look at things from a historical perspective to see what I mean... Notice how narrow the streets are inside the city proper? That is because they were not initially built to take the sort and volume of vehicles we have now. 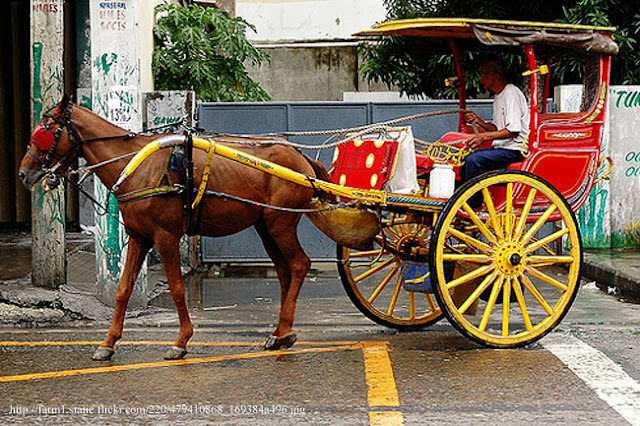 Fact is, I can still recall when there were horse-drawn calesas on the streets of the city. Tricycles eventually took the place of these calesas, but if anything, they took up even less road space. Tricycles, I regret to say, have become an irritant because of the changes that became inevitable to the city itself due to the passage of time. The population has grown and become more affluent and able to afford the purchase of personal or family vehicles. 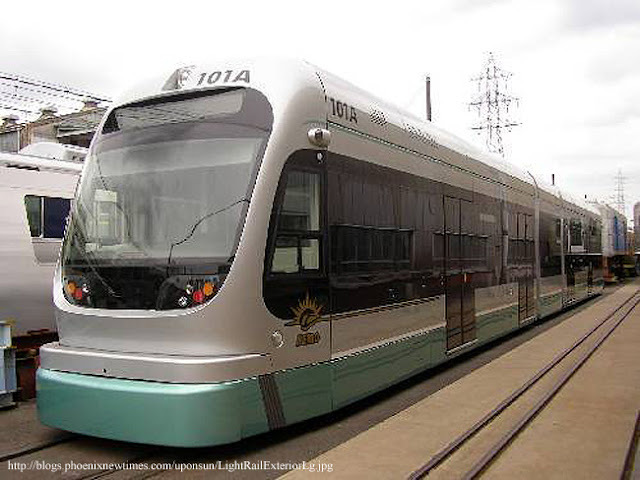 Any self-respecting city in any developed country will have its own mass-transport system for common citizens who cannot afford personal vehicles. Residential communities are also quite distinct from where citizens normally go to work. It is not uncommon for these citizens to drive or walk to the train station, then ride to work by light rail. The trip is reversed at the end of the work day. But I need to point out that this city we are in has been in existence long before urban planning became an academic exercise... How does one untangle the mess? Residences and commercial establishments are right in it in a huge hodgepodge of buildings! I also feel a need to point out that most developed countries are also in the temperate zone, which also means that walking is but a practical means to keep up one’s body temperature. Suffice it to say that I do not think a mass-transport rail system will come to this city in my lifetime. Neither will population increase be checked; transience and migration, if anything, will even increase the number of citizens.